Millions of people around the world seek advice from Bestselling Author and Speaker Jon Gordon. NBA, MLB and NFL Coaches want to know what is going on in Jon’s brain when it’s time to build a culture that leads to championships (not to mention future employment!) During Episode 13 of the Jim Huber Podcast “Listen and Subscribe Here,” we wanted to know WHAT IS THE BEST ADVICE JON GORDON HEARD IN HIS LIFE? After a thoughtful pause (Jon is a thoughtful guy! ), Jon revealed that a Doctor, James P. Gills Jr, gave him the most impactful words and advice he had ever heard. Dr. Gills is one of the most amazing people on Earth that you’ve probably never heard of. After reading up on him, I can firmly say it’s a sad state of affairs when we can all name a Kardashian, but don’t know about a man like James P Gills Jr. Dr. Gills has performed more lens implant and cataract operations than any ocular surgeon in the world. A prolific author, he distributes 40 thousand free books a month, many to prisons around the country. His books trail only the Bible as the most requested book in America’s prison system. 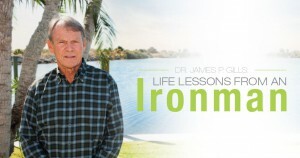 As an athlete, Dr. Gills is the only human on Earth to have completed a record setting six Double Ironman Triathlons, the last one in his fifties! For the uninitiated, yours included, take a full Ironman triathlon and double the distance of each event. That means a 4.8-mile swim, a 224-mile bike ride, and a 52.4-mile run. His other accomplishments are too many to list here. It seems obvious after you hear it, but how many of us talk to ourselves with powerful energizing words, as opposed to listening to that inner voice of doubt and fear? Humans are often driven and controlled by their inner fear of failure. To overcome that fear, stop listening to your inner voice and talk to it instead. Pick powerful words that mean something to you, and the next time that inner voice starts whispering the reasons you will fail, shut it up with the reasons you will succeed. Click Here to Learn More About Dr. James P Gills, Jr.
Dr. James P. Gills, Jr., through Seven Diamonds, wants to put a limestone blasting mine in our rural, working class, family-oriented community. A community defenseless to stop it. A community of working class, retirees, young families, middle class, those that struggle, and small businesses. That limestone blasting mine will abut my subdivision and will be in the Weeki Wachee Springshed. I say actions speak louder than words.